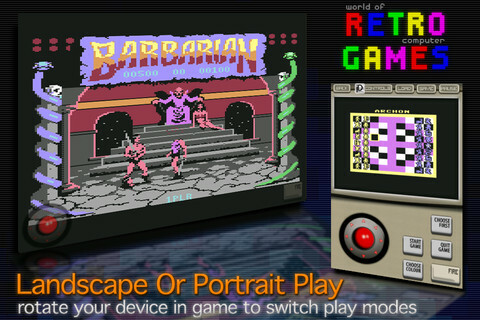 Retro Games, released by Elite, is essentially an emulator than runs the ancient 8-bit “classics” of old. It runs on the iPhone and iPad, with free and HD versions also available. 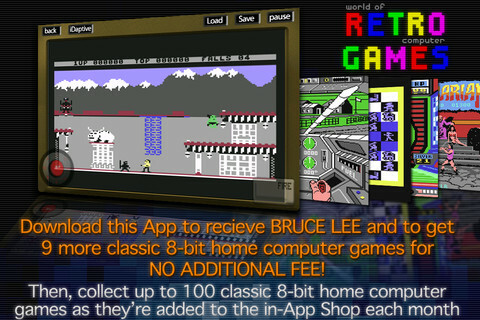 The app comes with Bruce Lee, as well as 3 game packs, with 3 games apiece. Well, the emulator works. It even has the graphics glitches when loading at times, and some games even feature the nostalgic garbled audio buzzes and bleeps that are just as annoying as the real thing! Seriously, though, Elite have done a good job of accurately recreating the original games, which look and feel like their aging counterparts. All versions of the app come with Bruce Lee. The paid-for version ($0.99) comes with the first 3 game-packs for free, including the following games: Archon, Tales of the Unknown, Infiltrator, Black Magic, Alternate Reality: “The City” and “The Dungeon”, Emlyn Hughes International Soccer, Monty on the Run, Barbarian: The Ultimate Warrior (aka Death Sword). Another feature of the app is the all-new “iDaptive controls”, letting you customize and reposition virtual buttons and joysticks to your heart’s desire on your touch screen device. It even lets you resize and move the “screen” itself (referred to as the canvas in-app). 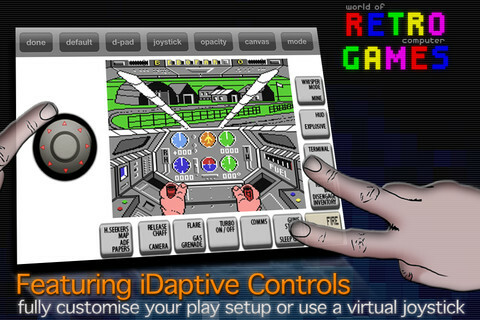 These controls are also compatible with the iCade. And this brings us onto the games themselves. While the emulator recreates the titles down to the pixel, they are still really old games. Which means that some of them are really hard, and most of them take a lot of figuring out (or at least require reading the huge, tome-like manual that comes with each game) to be able to even start playing. There was a couple of games hidden away in the 10 available that were playable… in a broken, glitchy kind of way. But the others are simply too old to be played by a modern gamer. 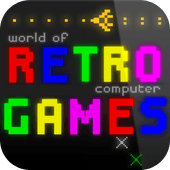 And Elite are going to be releasing a total of 100 titles for their new app, so I’m sure there will be more retro games that have some playability to them, but for now, I’m just not sure it’s worth the money. Now, Elite specialise in making these emulated games, and push out lot of these rehashed games to the market. So there’s obviously a decent amount of people buying these games for it to be worth their while. If you’re looking for a nostalgia trip, and want to remember those heady days of cartridges and tape cassettes, then you’re sure to get a kick out of playing your favourite classic titles. But if otherwise, there’s not much here for you but frustration and annoyance (a staple of games made that long ago). The sound is faithfully recreated, keeping the good ol’ bleeps and bloops of yesteryear intact. And they even kept the glitchy whines and dial-up-type sounds some of the older consoles had. The music is pretty good in these games, and with the resurgence of 8-bit inspired chiptunes and games in recent years, it’s quite interesting to see where it all came from. The graphics, too, are equally faithful to the original games. The sprites are simple, but descriptive, and some scenes are down-right impressive for the time and hardware they were made for. If you’re looking to blow some money to feel some nostalgia through one of your old faves, then by all means, have at it. Else, I’d give this one a miss. So all-in-all, some will think it’s awesome, and others will think it’s… not-awesome. I'm a web developer, creative writer, and game enthusiast.